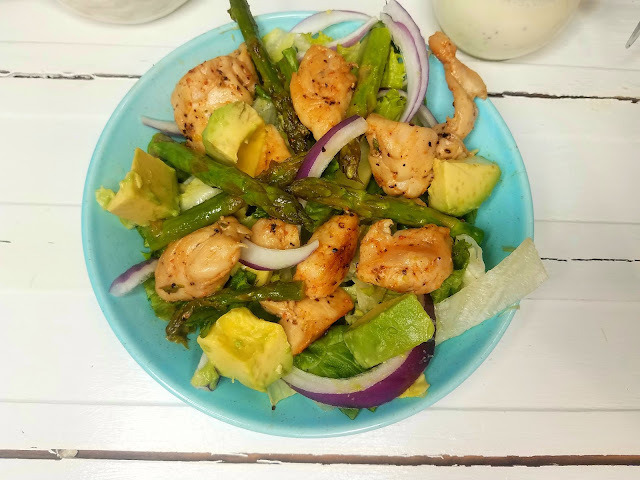 This Blackened Chicken, Asparagus and Avocado Salad with Lemon Pepper Yogurt Dressing is restaurant worthy, but only takes a few minutes to throw together! You'll find yourself wanting to lick your bowl clean..I promise! It's that good! This salad will have you craving it all summer long! It's simply divine, and you just have to make the Lemon Pepper Yogurt dressing to drizzle on top! Oh Mylanta! It just puts the salad over the top , and no other dressing would really do! Plus you can pronounce all the ingredients, and it take just a second or two to whip together! This recipe came from my daughter in law. She said it originally called for Shrimp, but she changed it to chicken to suit her young children and budget. Since I don't care for seafood, that worked just fine for me too! I will tell you, my husband only stopped eating it long enough to say how much he loved it... several times, and to make "Mmmm" sounds along the way! Seriously! It's that good! With great Sponsors like Michigan Asparagus and Adams Spices and Extracts my recipe was for sure to turn out fantastic! The asparagus was fresh from the farm picked! It was young, tender, and crisp! t he spices were flavorful with unique blends that taste like they discovered your own secret spice rubs and mix recipes! 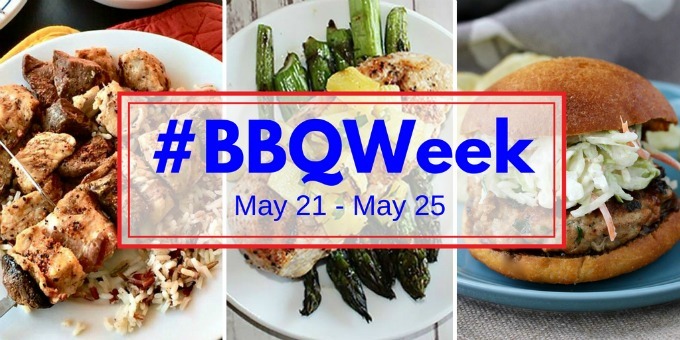 I used the Burgers & Fries blend of spices, a great all purpose blend that you will love using on many dishes! I grilled my chicken and asparagus in my favorite grill pan, but you can also put a cast iron skillet on your grill. or cook this on your stove top too. 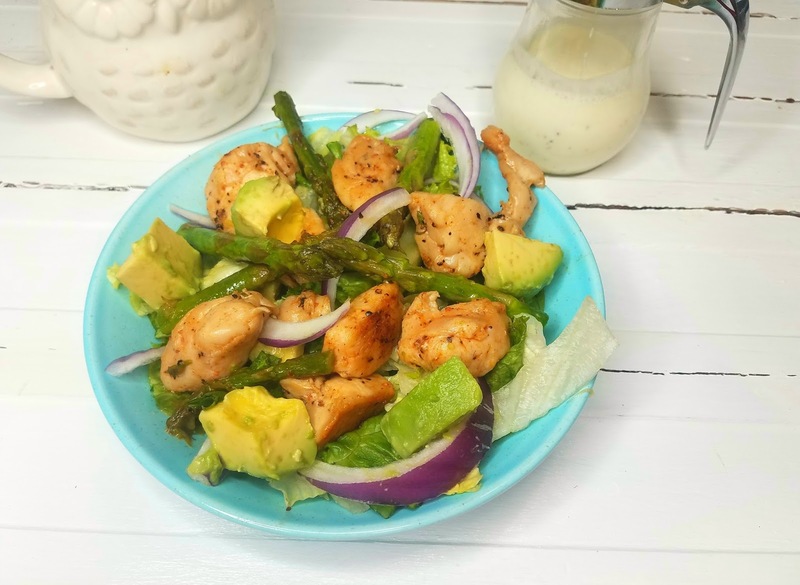 Grilled chicken and aspargus served over fresh greens and avocados with a fresh homemade lemon pepper yogurt dressing that will have you craving this salad all summer long! Cube chicken into bite sized pieces, and sprinkle with seasoning mix. Place in grill pan or skillet. Cut Aspargus in half, discarding bottoms. Place tops in grill pan. Drizzle chicken and aspargus with 2 Tablespoons olive oil and lightly toss. Cook on medium heat on grill or stove top till cooked through approx 7-10 minutues., turning occasionally. Lay salad greens in serving platter or bowl. mix in onions and avocados. 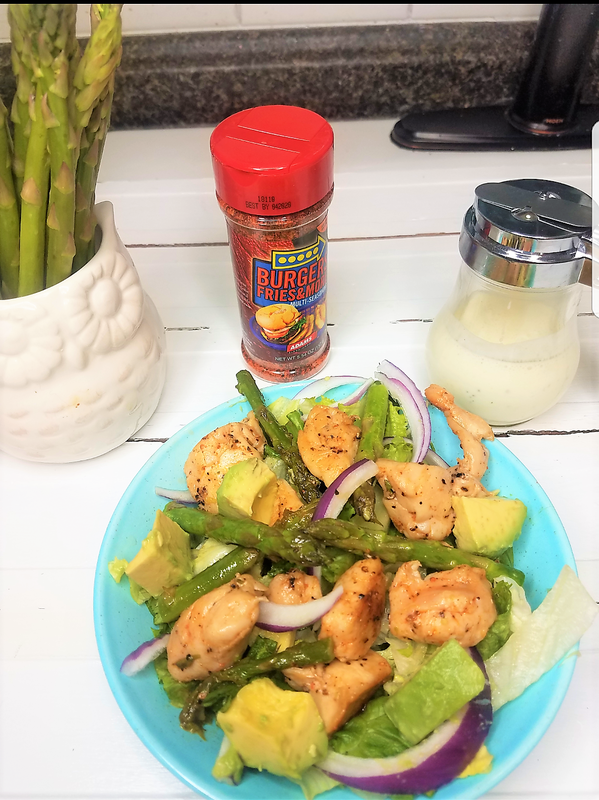 Layer chicken and asparagus on top of salad greens. In small blender or mason jar with lid, blend together , yogurt, lemon pepper seasoning, lemon juice, and water(or olive oil if you prefer). Shake or blend till well blended. That looks soooooo good! I love fresh food this time of year and I happen to have some of that lovely asparagus in the fridge. This is happening!